This years LSI Design Contest in OKINAWA 2006 is the 10th ANNIVERSARY contest. Originally, the LSI contest has been started from the design contest inside the Department of Information Engineering in University of the Ryukyus at 1998. From 2000, the contest has been opened to outside students and from 2001 the contest is co-operated with CQ publishing corporation and is opened to international students. In resent years, roughly one hundred students are trying to solved the LSI design contest task. In the Table 1, all design themes are shown. The 10th anniversary year design theme is Fast Fourier Transform Circuit, which is very famous signal processing technology. the FFT is the algorithm to reduce computation of Discrete Fourier Transform (DFT). This contest task is 64 point FFT, which is used in 802.11a/g/n Wireless LAN devices. The equation of FFT is shown as follows. This time N is 64. Although the equation is simple, the input signal x(n) is 64 point complex values and the output X(k) is 64 points complex values. Then the actual computation is not small. In the following section, the detail description of FFT will be shown step by step. Then please try this contest task even you are not familiar with the FFT. The requirements of the design is to write HDL (VHDL or Verilog HDL) and to synthesize digital circuits using Synopsys design analyzer or any other EDA tools. Making FPGA is also optional but our judges love to see your FPGA designs. Figure 1 show the block diagram of the system. The system is composed of two parts, Signal Sender and FFT. Since the inputs and outputs signals are series of complex values, I port is used for Real component of the complex and Q port is for Imaginary component of the complex value. All 64points are input to FFT serially as shown in the figure. The FFT output is also serial manner. The head position of the series is indicated by another HEAD signal, although it is now shown in the figure. One famous application of DFT is spectrum analysis of a signal. One typical application is shown in figure 2. x(n) signal is analyzed signal and total N points. The x(n) signal is roughly one cycle signal in duration N points. DFT of x(n) results X(k). At k=1, |X(k)| has a large peak. This means x(n) has a element of one cycle per N points frequency components. In addition, at k=N-1, another peak is observed. The N points DFT output has cyclic characteristics. Then index k=N-1 has the meaning of k=-1, that is, Negative frequency. Since the signal x(n) signal (Real Signal) is composed of k=1 positive and k=-1 negative frequency components, X(k) has k=1 and -1 components. Following are equations of Discrete Fourier Transform (DFT) and Inverse Discrete Fourier Transform (UDFT). N points x(n) signal is transformed to N points X(k) by DFT. Fast computation algorithm of DFT is Fast Fourier Transform (FFT). But, FFT needs the restriction N=2l (l=integer). IFFT is Fast computation algorithm of IDFT. If we take a look at those FFT and IFFT equation. Looks like very similar but two differences. Since the differences are small, if we have FFT circuit then IFFT can be made as Figure 3. Since the design task is FFT, let's take a look at FFT algorithm more deeply. Here we introduce a Twiddle Factoe WN. The FFT equation can be rewriitten as follows. Twiddle means "Turn around with fingers" then it is the factor of rotation. Please have imagination of 2 dimensional surface with two axis Real and Imaginary (complex surface). According to the Euler's law ej�� is as follows. If we change ��, ej��goes round on radious=1 circle on the complex surface. Then this ej��indicates the rotation. In another word, this rotation function ej��is called complex sinusoid. In the Fourier Transform, the signal is analyzed using this complex sinusoid. Counter-clockwise rotation corresponds to positive frequency and clockwise rotation corresponds to negative frequency. Then the twiddle factor WN indicated on the complex surface is shown in Figure 5. (WN)m is simply m-times rotation of WN. When m is increased, the point is rotating on the circle. In order to understand the FFT more visually, 4 point FFT equation is converted to matrix notation in figure 6. In the matrix notation, 4X4 twiddle factor matrix appears. The 1st row has all 4 W0. In the second row, twiddle factor is rotating on the circle once with clockwise direction. In the third row, twiddle factor is rotating on the circle twice. In the 4th row, twiddle factor is rotation on the circle onece with counter-clockwise direction and this can be considered as three-times rotation with clockwise direction. Figure 7 shows this rotation visually. Usually in digital signal processing text books, FFT computation uses Butterfly circuit, especially it is radix-2 butterfly. However, in this section, FFT computation with radix-4 butterfly will be explained since the radix-4 butterfly needs less computation recourses. Because of 64=43, FFT index is changed as follows. There are 3 �� computations. This corresponds to Three stages architecture. First expand the summation relationg to n2. Here, Characteristics of twiddle Factor WN, �A(WN)0=1, (WN)1N/4=-j, ( WN)2N/4=-1, ( WN)3N/4=j are used. This x1 computation is the TASK at the first stage. Then the following stages gets the result of the 1st stage as input and compute X(k). Actually this is same as 16 point FFT. However, there are 4 cases k0=0, 1, 2, 3 . As a result 4 times 16 points FFT computation is needed in the following stages. Each x1 computation needs 4 inputs then we call this comtation as radix-4 butterfly. Consequently the STAGE 2 computes x2. This is also same as radix 4 computation. Again the summation relationg to n0. In this 3rd stages, no twiddle factor computation is needed. At the stage 3, x3(k2+4K1+16K0) is computed. However, original index was (k0+4K1+16K2). Then the index values are exchanged. Then in order to have correct index, x3 results have to be re-ordered based on the following equation. As a conclusion, 64 points FFT computation based on radix-4 method needs totally 4 stages including re-order. The computation architecture is shown in figure 8. Since in order to fully understands the FFT computation, to read MATLAB code is one good method. Please pay attention that in MATLAB index starts from 1 not 0. SCILAB is similar SCIENTIFIC calculation software which is available in the following URL as a Free S/W. Here we introduce one circuit implementation example, which is shift-register-based serial processing FFT. According the section 3, Stage 1 needs 16-point apart 4 inputs and computes 16-point apart 4 outputs. In stage 2, 4-point apart 4 inputs are needed, and in stage 3, neighboring 4 inputs are needed. The Stage 3 computation can be processed as follows (Figure 9). The rectangle block means shift registers. Input data are serially coming into the shift registers. There are total 7 shift registers. Every clock, the input are shifting. 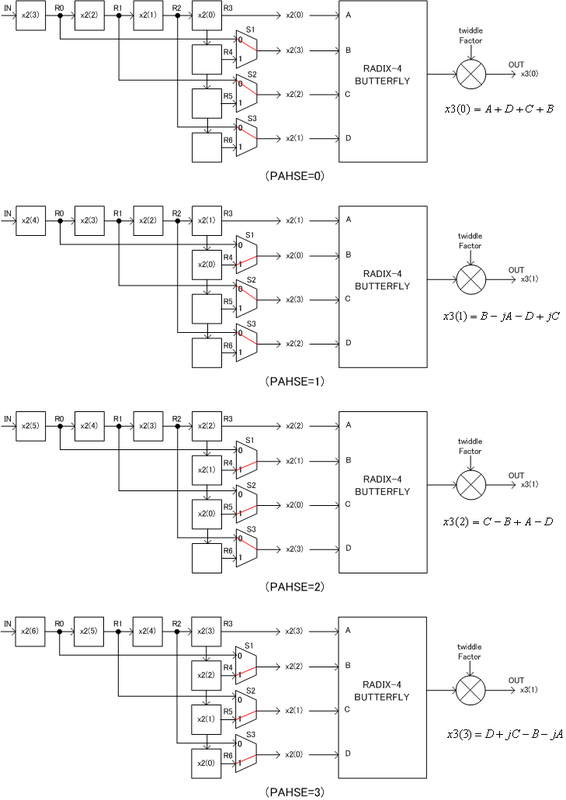 By controlling the multiplexer, 4 inputs which is needed for radix-4 butterfly are inputted to the butterfly circuit. The butterfly circuit has to multiply 1, j, -1, -j to the inputs. However, this multiply is just exchange I (Real) and Q (Imaginary) components and change sign. Then actual implementation can be done with multiplexer and adders. The output of the butterfly has to be multiplied with twiddle factor. Then complex multiplier is needed. But, in stage 3 only, twiddle factor is always 1. Figure 10 shows the operation waveform of the Stage 3. HEAD signal is asserted at the beginning of the signal. The 4 yellow points are first radix-4 inputs. R0 to R6 shows the signal of the shift registers. PHASE signal has to be generated from HEAD signal assertion. S1, S2, S3 swicth signals, which controlle the multiplexers, are generated from the PHASE signal. A, B, C, D signals are inputs to the butterfly circuit and during 4 cycles same 4 signals appearing by some rotation. During this 4 cycles 4 radix-4 butterfly computation is executed to generate OUT signal. OUT_HEAD signal indicates the beginning of the output sequences. Other stage procesing can be realized by changing the shift register length of stage 3 circuit. Of couese, twiddle factor generation and complex multiply is needed. Figure 11 shows the case of stage 2 as a example. Since 4-point apart input signals are needed to butterfly computation in stage 2, there are 4 stages between each of R0, R1, R2, R3, R4, R5, R6 registers. In this case continuous 4 points processing needs same PHASE state. Then, every 4 cycles PHASE counts up. 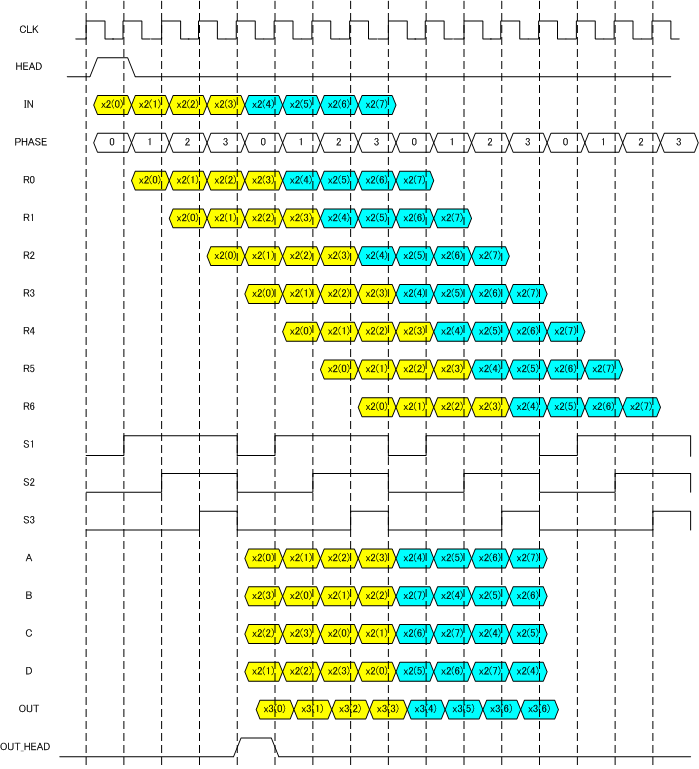 For Stage 1 there needs 16 shift registers between each of R0, R1, R2, R3, R4, R5, R6 registers. As explained in the previous section, following reorder has to be implemented. This means x3(0), x3(1), x3(2), x3(4), ... outputs corresponds to X(0), X(16), X(32), ...outputs. In Table 2 detail reordering relation is shown. If you take a look at the table well, there are some rules. The reorder can be implemented using shift registers and/or memories. Table 3 shows the comparison between <4,2,u> and <4,1,t>. Table 4 shows some attributes examples. Same 4 bit width binary can be used to express various ranges and resolutions. Then two complex value a+jb and c+jd can be added as follows. two complex value a+jb and c+jd can be multiplied as follows. Then, complex multiply needs 4 real multiplier and 1 subtraction and 1 addition. Figure 12 shows examples of the circuits. 64 points FFT design needs (W64)0 to (W64)63 64 complex values as shown in figure 13. The real (I) component is cosine and the imaginary components (Q) is -sin. Then the two 64 word ROM can be used to store twiddle factor. Here we provide, two 64 word x 10 bit ROM data. The 10 bit format is <10,0,t>. In this level, designner must assume input signal coming in serially with HEAD signal as shown in figure 14. Design FFT circuit which generate FFT outputs and OUTHEAD signal with some latency. The latency is arbitrary. Following are 5 input and output signal examples. The 1st wave of figure 15 is 1+0j fixed inputs. The corresponding outputs is the 2nd waveform. At index=0, 64.0 outputs and all 0 s for other index. The 3rd waveform is one cycle complex sinusoid inputs. Input= cos(2*pi*n/64) + j sin(2*pi*n/64) n=0...63. The 4th FFT output has peak of 64.0 at index=1. The 5th input is also one cycle complex sinusoid. However, the initial value is different. 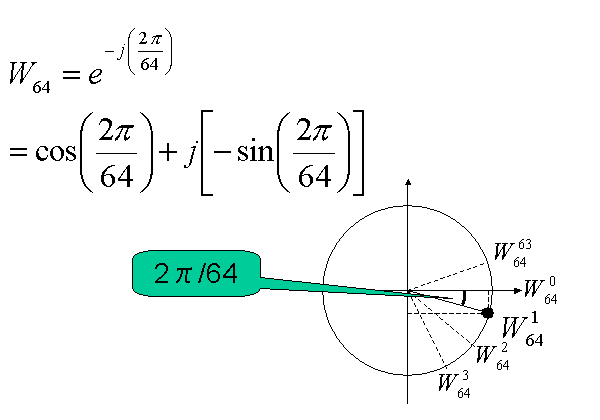 Input=sin(2*pi*n/64) - j cos(2*pi*n/64). Similarly with 3), the 6th FFT output has peak of -64.0j at index = 1.
cosine signal has two different frequency of complex sinusoid of +1Hz and -1Hz with amplitude = 0.5. The the 2nd FFT output has two peaks of 32.0 (half of case 2, 3) at index = 1 and 63. According to FFT cyclic property, 63 can thought -1. The 3rd waveform is 15 cycle complex sinusoid input. Then the 4th FFT output has peak of 64.0 at index = 15. Here, we provide the those five input waveforms as follows. Format is <8,0,t>. Please make use of the inputs for your test on the design. If you have a interesting, different, novel, surprising idea relating to this FFT design. You can modify the specification given in . Please design unique circuit. In order to make easy comparison among many design entries. Please follow the guide on ROM and/or RAM in your design. Do not use H/W macro RAM. Use synthesizable RAM description and synthesize your RAM using Flip-Flops. If you can not use synthesizable RAM for you design, please state the reason clearly in your report. Do noy use H/W macro ROM. Realize the ROM by synthesized combinational logics. THE DEAD LINE IS 2006/JANUARY/26TH!